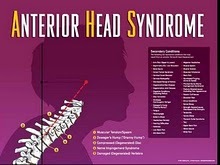 Anterior Head Syndrome is an epidemic in our society. I could literally have a practice that just focuses on this serious primary condition. Anterior Head Syndrome, or AHS for short, is a structural condition in the human body where the head has moved anterior or forward compared to the upper back and shoulders (see picture above). Where should the head be, you ask? When looking at person from the side, the head should be centered directly over the shoulder. Because the ear is fairly centered on the side of the head, a good visual landmark for normal head position is the ear being centered over the middle of the shoulder. Did mom ever tell you to "Sit up straight and don’t slouch?" Maybe you should have listened! Think about all the things we do that cause us to look down: poor ergonomics at a desk, laptops, texting, hand held video games, picking up children, reading, etc... Then there is the poor sitting issues such as the car (reclining the seat too far back) or the "slouch couch". And let us not forget that lager bellies (whether due to pregnancy or being over weight) will jut the head anteriorly to balance the body. So unless you are a svelte, ergonomically conscious ceiling painter, there is a good chance that you spend some time looking down with your head forward. So whats the big deal? Several things happen to the body when the head is anterior compared to the shoulder. For starters, the average adult human head weighs between 10 and 14 pounds and it takes minimal muscle effort to hold the head upright when it is centered over the shoulders. BUT, for every inch the head shifts forward, the weight of the head increases by at least 10 pounds, and the muscle effort needed to hold the head up significantly increases. Picture holding a bowling ball close to your body and then extending your arms forward with the bowling ball in your hands. The bowling ball gets much heavier as you extend the arms! Simple laws of physics and leverage. So your 10lb head now weighs 20- 30lbs if it is 1 - 2 inches abnormally anterior. This is why many people feel "tight" in their neck, shoulders, and upper back or tired at the end of the day. Oh, but there is more.. The good news is that AHS can be corrected if caught earlier enough. Correcting AHS is not an easy task and can take some time and effort. Traditional chiropractic manipulative style treatments usually do very little to address the issue. Most physical therapy and massage style muscle treatments usually do very little to affect the, ligaments and neck curve aspect of AHS. We use specific corrective techniques and rehabilitation that is designed to correct AHS. Finding a provider that focuses on structural correction of the spine and one who works on AHS every day, is a crucial step in improving you health. Questions or concerns about AHS? In office consultations are no charge. Its a conversation not a commitment.